I’m so excited to share the cover of my new middle grade novel FOCUSED with you! Following Braced, which had three starred reviews, comes a story of a girl caught between her love of chess and her ADHD. Read my interview with Scholastic’s Ambassador of School Libraries Mr. Schu! Clea can’t control her thoughts. She knows she has to do her homework . . . but she gets distracted. She knows she can’t just say whatever thought comes into her head . . . but sometimes she can’t help herself. She knows she needs to focus . . . but how can she do that when the people around her are always chewing gum loudly or making other annoying noises? It’s starting to be a problem—not just in school, but when Clea’s playing chess or just hanging out with her best friend. Other kids are starting to notice. 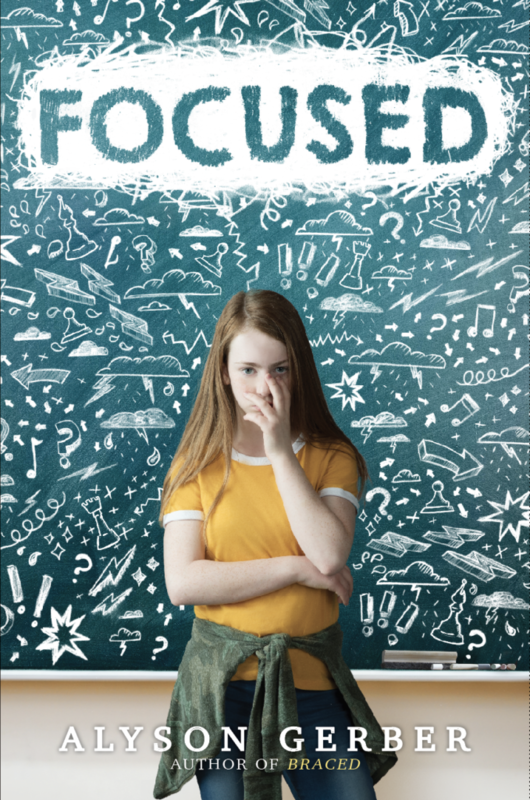 When Clea fails one too many tests, her parents take her to be tested, and she finds out that she has ADHD, which means her attention is all over the place instead of where it needs to be. Clea knows life can’t continue the way it’s been going. She’s just not sure how you can fix a problem that’s all in your head. But that’s what she’s going to have to do, to find a way to focus. In a starred review, Booklist called Alyson Gerber’s first novel, Braced, “a masterfully constructed and highly empathetic debut about a different kind of acceptance.” With Focused, she explores even further how, when life gives you a challenge, the best way to face it is with an open mind, an open heart, and the open support of the people around you.